Lies dieses Review auf Deutsch! The book 'Clockwork Angel' takes place in the victorian era in England, following 16-year-old Miss Tessa Gray as she comes from New York City to England to find her brother Nate. She gets inprisoned by the Dark Sisters, Miss Black and Miss Dark, who teach her to "Change", meaning she can change into any human (dead or alive) and touch their minds by holding one of their items. After about six weeks in the Dark House, a handsome guy with black hair and blue eyes, William 'Will' Herondale, frees her. She learns that Will is a so-called 'shadowhunter', fighting demons to protect normal people, the mundanes. He takes her to the Institute (an old church used as shadowhunter base in London) where Tessa makes a deal: she helps the shadowhunters with fighting potential danger (using her talent to Change) and they help her find her brother. Also Tessa develops a little bit of intimacy with one of the guys, you're gonna have to read the book yourself to find out with whom (huge spoiler: it's not Henry!). I really liked this book, especially that it was set in victorian times, it actually makes me want to live during that time period, obviously as a mundane, I'm too much of a coward to face a demon or vampire. The way Mrs. Clare wrote 'Clockwork Angel' made me think I was actually there with Tessa experiencing what she did, the only thing I couldn't understand was the way Tessa Changed, but that might be a consequence of me being German and not understanding the words properly %D. I bought the book in September and didn't read it until christmas, so I was pretty spoilered by Twitter and I had thought it was the same concept as the Mortal Instruments: girl misses a family member, tries to search it, finds help with the shadowhunters, a love triangle develops, but this is not entirely the case, considering that I didn't see a love triangle at all - obviously people compare Jace-Clary-Simon to Will-Tessa-Jem, but in my opinion, there was too few Jem-Tessa interaction to judge wether it's team Jem or team Will. I personally have the feeling that Jem is a part of Will, the good part, like - if you're familiar with classic German literature - Mephistopheles being a part of Faust, with Mephisto being the bodily driving side and Faust the academic side. 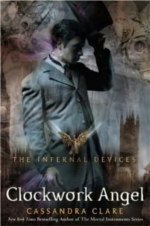 Transfered to Clockwork Angel Jem would be the 'human' side and Will the one driving everything to its extreme. Clockwork Angel also provides some historical facts and how the world was back then, even Tessa critizising emancipation. The only things I don't understand are what these cogs really are and what the carriages really look like, but that's based on my being German. I recommend Clockwork Angel to everyone who is a fan of fantasy, Cassandra Clare's shadowhunter world and especially everyone who wants to read a book that contains love and action, without too big stress on one of them. Now even though this is a Young Adult book, I also recommend it to historians interested in the victorian era since CA has much information how people behaved back then. I'm sure even my dad would read Clockwork Angel if it were already out in German and he's one to only read enciclopedia an non-fiction books and he seemed pretty interested when I told him about the story. I have no idea what cogs are either, but that's because I'm mexican and I too read them in english. Great Review. I had the same feeling when it came to Jem and Will.